Visiting Cuba and renting a car are not things that essentially go hand in hand. Many travelers to Cuba this summer will need to find alternative transport unless they have booked a vehicle in advance; this is the information emanating from colleagues at the big four car rental agencies in Cuba of CubaCAR, Havanautos, Via Car Rental and REX. This summer is set to be one of the worst for those hoping to discover Cuba from behind the wheel of a car. Primarily due to President Obama’s historic announcement, more Americans are visiting Cuba, making a bad situation worse. However, for those of you with the ability to book your Cuban Rent A Car in advance, all the above official websites still offer availability at the writing of this article. We contemplate that from June 15th it will become gradually more difficult to acquire a Car Rental in Cuba and by July 1st, it will be almost impossible to secure a car unless cancellations are placed back online. Visitors are urged to check the official websites listed above or contact the chat system to try and obtain a cancelled car after July 1st. One bit of good news is that Cuban rent a car company Havanautos has replaced its Hyundai Accent models with the sleek 2015 model shown above. 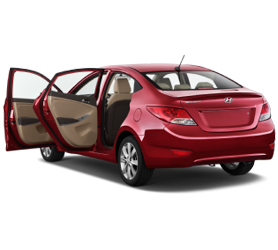 For those of you searching for a 5 seat medium category car this summer try to book the Hyundai accent with Havanautos and you’ll get a new car! Car Rental in Cuba for December 2014 and January 2015 just got more complicated for many visitors to Cuba during the holidays. As of today Cuban Rent a Car companies Havanautos, CubaCAR, REX and Via Gaviota have ceased confirmations of Car Rentals in Cuba for travel agents and third parties. Therefore, from today it’s only possible to confirm a rent a car in Cuba on the official websites shown in the grey bar above – CubaCAR, REX, Via & Havanautos. Thankfully, there is still lots of car availability in Cuba when booking directly for: Economy Manual stick shift, Economy Automatic, Full Size (Called medium in Cuba) Manual and Automatic but, again, only when you book using the official websites. Many travel agents and affiliates have already published the bad news that they can no longer confirm cars for December 2014 and January 2015. Consumers should be wary if they are being told there are vehicles available when plainly agents can no longer confirm cars in Cuba. 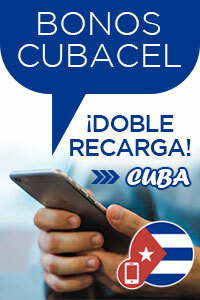 As of writing this report 11 cars were confirmed with CubaCAR Cuba when booked directly. This confirms the ongoing availability of cars when booked directly with the websites shown. Happy Holidays to all and good luck with your Car Rental in Cuba! 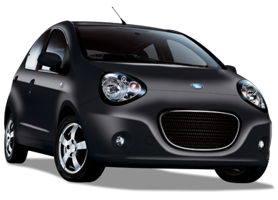 In time for the summer 2014 Cuba Car Rental season, the Geely Panda enters the fray as Cuba’s cheapest Cuba car rental offer. Powered by a frugal 900 cc gas engine, the car offers 5 seats and is available in the economy segment of Cuban car rental categories. The version of the Geely Panda offered in Cuba offers updated air-conditioning which in Geely speak is called the “tropical pack” along with upgraded cooling system and bigger brakes. The car available on Cuban roads is therefore heavily modified for the car rental market in Cuba. Available from $31 USD per day, it provides an excellent and above all CHEAP way of getting around and much less expensive than other economic cars in Cuba. The Geely Panda is a Chinese developed and manufactured compact which was awarded a 5-star rating in crash tests and is subsequently the safest Chinese hatchback as of 2014. The Geely Panda was able to achieve the above results despite a development process that relied more on computer simulations than actual crash tests. The Geely Panda will soon be manufactured at the new Geely plant in Cuba and as such will be a locally produced vehicle which should see Car rental rates on Geely models plummet in the future. Havanautos loaned us a Geely Panda for 3 hours in June 2014 prior to its official Car Rental launch. With just three hours we were able to head out to Havana’s Playa del Este eastern beaches and drive through the picturesque coastal town of Guanabo at low speeds before returning on the highway back to Havana. The Geely Panda faired very well in this short road test, the space inside belies its minute size and it’s easily big enough for short trips with 3 adults. The ride was exemplary and the car feels well made. For now though, the Geely Panda is Cuba’s cheap car rental offer and arrives just in time for the summer car rental season in Cuba. To Rent the Geely Panda in Cuba, use the official link to Havanautos Cuba above. Due to the drastic reduction in fleet purchases for 2014, Cuba Car Rental companies Havanautos, REX, CubaCAR and Via have recently introduced discounts for advance bookings. Responding to recent reports on Tripadvisor and Lonely Planet’s Thorn Tree of travelers being unable to acquire a rent a car upon arrival in Cuba, all four car rental firms have introduced up to 15% discount when booking on officially approved websites (see links above). The idea is that with sufficient advance bookings the firms can tailor fleet purchasing, which takes place in May, to suit high season months of June, July and August. The discounts on Cuba Car Rental will only be applicable for prepaid bookings made online between April 15th and June 15th 2014. Renting a car in Cuba will also be subject to the new Quick Delivery® program introduced in December 2013 by all major car rental firms. The Quick Delivery® tries to resolve numerous complaints about pre-booked cars taking too long to deliver. From now on, those who book cars will be able to opt to provide their driving license and other details in advance and collect their car from the Quick Delivery® line at all rental offices. Reports from the first clients who used this program appear to be good, July Pennington from Massachusetts, USA said “this new system got us our car in less than 10 minutes, it really works”. Basically, the system works by pre-completing rental contract formalities and assigning exact vehicles before client arrival. Much like similar programs operated by Avis and Hertz, the car keys and the contract are then held in an envelope behind the Cuba Car Rental desk and then need only to be signed by the renter to obtain the car keys and be on their way. Cuba Car Rental companies REX, Havanautos, CubaCAR and Via have purchased new models for the upcoming 2014 season. These models include the Morris Garage MG3 and, the larger MG6. The test was conducted around the Miramar area of Havana right next to the main Transtur Cuba Car Rental depot. We only had the cars for 1 hour each so we couldn’t test them on bumpier roads in Cuba nor on the ocho via freeway. These Chinese built cars came with special “Cuba specification” we were told, which included higher profile tires, more powerful air-conditioning and a basic CD player with aux-in jack. 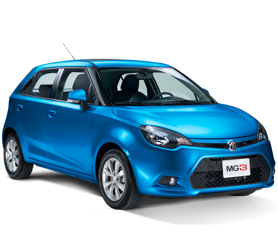 Both the MG 3 (economic category) and MG6 (medium category) are not without appeal. The exterior could generously be described as strangely attractive, while the interior is decent enough, with tastefully placed chrome strips and some decent fit and finish. The emphasis has been placed on sturdiness over style, and some basic comforts like a telescopic steering wheel are absent, but it is at least functional in terms of space and desirability over similar category cars in Cuba which are invariably older and not without their problems. Of you are visiting Cuba this year, try to request these cars instead of the similar (and older) Peugeot or Hyundai options. These cars won’t appear online for direct booking because they simply appear as part of the category listings but ask to receive one and you won’t be disappointed with your Cuba Car Rental this summer. 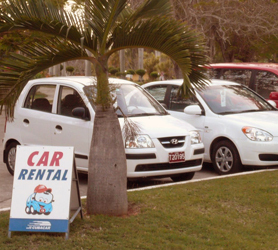 Over the months of summer, Car Rental Cuba has received reports back from consumers who have rented the Geely Emgrand. The Geely Emgrand is a Chinese manufactured medium high vehicle with powerful upgraded (for Cuba we hear) air-conditioning, CD player and aux in for mp3 players. While initially reticent concerning the recent batch of the smaller economic Geely CK vehicles, initial reports back concerning the Geely Emgrand are surprisingly good. 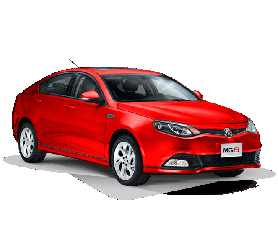 The car seems to be targeted at the higher automobile segments due to its quiet operation, large interior and generally good handling. One report came back from a client from Miami who rented the Geely Emgrand in Holguin Airport, traversed across to see family in Santiago de Cuba and then drove all the way back to Havana, leaving the vehicle in Havana´s Jose Marti Airport. Covering just over 2200km, the car was faultless. More revealing were his comments that the car was ideal for longer journeys due to its relaxed tall gearing and excellent sound insulation. Most other visitors who booked the Geely Emgrand with Car Rental Cuba covered less kilometers but were equally impressed with the vehicle, especially the remarks concerning the air-conditioning being amazing. 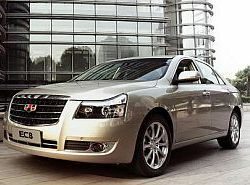 As you can see from the photo, the Geely Emgrand is an imposing piece of automotive beauty and very unlike other offerings from Chinese manufacturers. The car is available in from CubaCAR in the manual (stick shift) version and Havanautos for the 5 speed automatic transmission. 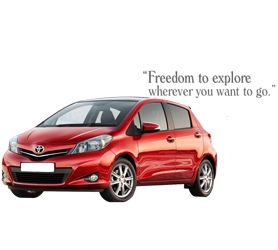 Book the car using the links above and we´re sure you won´t be unhappy with your selection from Car Rental Cuba. Car Rental Cuba gets reports all the time of cheap gasoline being offered to tourists visiting the island. While this is more common place for casa particulares and homestay tourists, where the owner knows someone “with a great deal” on apparently good fuel, the temptation can be high when fuel costs in Cuba are relatively high. However, the damage to your vacation time, wallet and peace of mind makes it simply not worth it. Car engines, like those in rental cars in Cuba, these days operate on fine tolerances and at very high pressures. Some modern systems run at between 350 and 1600 bar and are lubricated by the fuel. 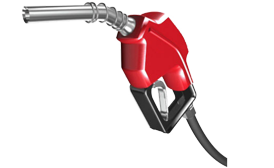 Adding bad fuel can cause damage to the pump through metal to metal contact. Metal particles from the damaged pump can be deposited in the fuel causing further damage to the rest of the fuel system. Some fuel system seals can be affected by the compounds in bad gasoline too. The more cheap contaminated fuel goes in the system the more expensive the repair. In some cases it can be cheaper to fit a new engine. If you want to have a trouble free time in Cuba, simply stick to pumped gasoline from official gas stations. Black market gasoline may be cheap but it will certainly work out very expensive if something goes wrong and you destroy the car’s engine or end up stranded miles from anywhere. A sure fire way of making your Car Rental Cuba a nightmare is messing with this cheap fuel. Taking a car rental in Cuba is by far the best way to discover the island. Having your own car helps you get off the beaten path and into places that usually don´t see many tourists. It’s not for everyone though! Driving a car rental in Cuba requires an experienced and competent driver who can handle a manual transmission and knows how to change a tire before considering driving in Cuba. Most rental agencies have a minimum age of 21 years for drivers when you show up and haven´t booked in advance but by using the above links the age is reduced to 18 unless you are looking for some expensive rentals the minimum age can be 25 but these are for Audi A6 or BMW 5 series models. You should remember that Car rental in Cuba is all about driving in a developing country with a road system and traffic laws much different than what you’re likely used to at home. Therefore, proper research is important, especially for a first time visitor who has not driven in other countries before. If your alone or with friends, picking up hitch-hikers can be a very pleasant experience and way to meet real Cubans going about their daily lives. Hitchhiking in Cuba is very a popular way for the locals to get around and is widely practiced by all ages of the population. When youyou’re your Car rental in Cuba remember to lock all your stuff in the trunk for security, but also so there’s more room for people inside. A bottle of water or a juice is a luxury for someone who has been standing in the sun on the side of the road for a couple of hours with small children or an elderly person. A few small snacks for the kids is also nice too. Losing your way in Cuba is fun! Especially if you take a hitchhiker to help you rediscover your route. As soon as you get your car remember to buy a road map of Cuba. A good one offered for free by Transtur is “Guia de Carreteras” Otherwise, it costs about 12 CUC. When you pick up your car rental in Cuba be sure that every scratch and nick is confirmed on the contract. This is welcomed by Car rental employees and is a sure fire way of ensuring you know what was on the car before you got it. Contrary to popular belief, most cars are actually quite new. Take photos from all sides and ensure you have some visible landmarks at the rental office as your backdrop or, better still, with the rental guy in the photo. Check the spare tire and that the tools are there to change it before pulling away in your Car rental in Cuba. Check the air conditioning, the radio and that all the locks work. Is the antenna in place? Are the headlights and turn signals working? If you find something doesn’t work correctly or is missing either replace it, get them to fix it, or have it confirmed on the contract so you’re not hit with the bill later. It is law that all car rental in Cuba have all legal drivers listed on the rental contract, do this before you take the car or visit any rental office and add the driver afterwards but don´t let someone drive who is not on the insurance and contract. Keep the rental contract in a safe place and not just the glove box. Keep it just as safe as your passport. Losing it means lots of hassle and a fine when you return the car because all road fines in Cuba are written on the contract and are payable when you return the car so, a lost contract is a red flag that maybe you got fined and don´t want to pay. Always park your car rental in Cuba in a designated area where there’s adequate security. Paying a parking attendant a few cents is cheap, and good insurance that he´ll keep and eye on your vehicle. Also, if anything untoward happens it makes the police report easier. Overall, Car rental in Cuba can be the difference between a good vacation and a fantastic one. You´ll get to see so many side of Cuba that normal tourists don´t see. You´ll also get to travel at your own pace and see all the sites you´ve been thinking of. Yes, car rental in Cuba is the way to go! 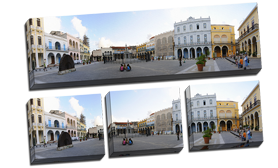 For many of you this is common sense during your Cuban vacation but we´ll outline several points to watch out for. Never leave your kids sat in a car in Cuba. The heat and sun can be extremely powerful and cause dehydration quite rapidly. Keep water in the car. Heat and fatigue require lots of hydration and finding the next gas station in Cuba is not as easy as it is back home. Ideally leave your hotel with ample water for the trip by filling up bottles or buying some at the gifts store in the lobby or convenience store. The sun in Cuba is stronger than where you live due to the islands proximity to the equator. If your rental car is not equipped with blinds take some of the cheap foldable blinds with you on vacation and attach them to the windows. Never ever leave kids in the car and the keys in the ignition, even if you are outside your hotel and running back into the room for just a minute. Never let kids roam around the inside of a car, especially when you are parked on an incline. Tragic and fatal accidents have happened when a child has accidentally released the handbrake. Do not turn around to pick things up or give things to your kids when driving. If you must, pull over, or at the very, least wait till you get to a red light and put on the handbrake before you reach around behind you. Never text while driving at anytime and this of course includes while driving children, again if you need to text pull over and park, If you must talk while driving, then use a hands free kit, but it is still safest to try to avoid using the phone even on hands free, as concentrating on what the person on the other end of the phone is saying, definitely lowers your concentration on the road. 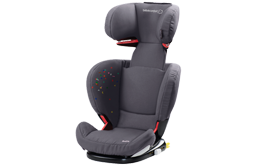 Rent with REX car rental who offer child seats and make sure the child seats you are using are age, weight and height appropriate. 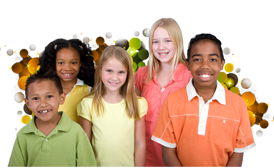 Do not allow children to have sharp object, food or toys that could be dangerous if you stop suddenly. Or large toys or balloons that may block your vision when you drive. Following these common sense tips will make your trip to Cuba enjoyable and your driving on this beautiful island trouble free for you and the kids!